Mayo Clinic researchers have developed a new method that nearly quadruples the detection rates of invasive breast cancers in dense breast tissue. 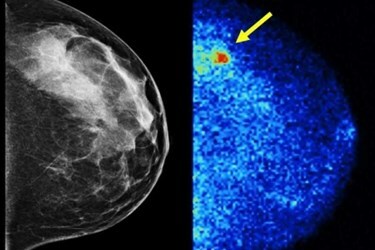 The technique is called molecular breast imaging, and it could supplement existing mammograms with only minimal increases in radiation exposure. Dense breast tissue often appears white on a mammogram. Generally, tumors are also rather dense, which means that they can also show up as white in the image. Dense breast tissue is commonly found in up to half of the women in the screening age group, which indicates the importance of having another option for breast cancer screening. To overcome these diagnostic challenges, a supplemental technique called molecular breast imaging (MBI) was recently developed by Mayo Clinic researchers, according to a recent article from the Mayo Clinic News Network. The method uses a direct-conversion gamma camera that is built from semiconductor materials. These cameras detect a radiotracer that is injected into the patient’s blood stream, which is absorbed by tumors. To validate the efficacy of the test, the Mayo Clinic team performed it on 1,585 patients, according to a recent study published by the team in the American Journal of Roentgenology. Out of the 1,585 patients, 21 were diagnosed with cancer, and only two of these instances were detected by mammography alone. Of the patients with cancer, 14 were identified by MBI alone, and two patients were detected by neither approach. Of these 21 patients, 11 had invasive cancers, although nine of those were lymph node-negative, which means they were caught early enough to have much higher chances of treatment success. A typical detection rate for mammography breast cancer screening is 3.2 patients per 1,000, according to the study. With the MBI technique, however, this rate jumped to 12 patients per 1,000 screened, an increase of 363 percent. Analysis of the mammography screen showed it to have a sensitivity of 24 percent and a specificity of 89 percent, while the sensitivity for both mammography and MBI was 91 percent with a specificity of 83 percent. The isotope used to achieve these results was 300-MBq 99mTc-sestamibi, and the quantity administered led to only a 2.4 mSv dose to the patient, which is acceptable for a screening exam. Improvements to breast cancer diagnostics are being pushed forward on many fronts. Improving the ability to image tumors by supplemental methods has also met some success when microwave energy is used as the imaging wavelength.